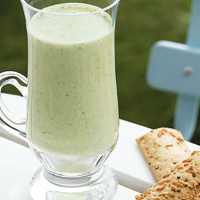 Fresh mint and Greek yoghurt give this lightly flavoured chilled soup a Mediterranean flavour. Melt the butter in a large saucepan then add the garlic, onion and rosemary sprigs. Fry for 5 minutes until the onion is translucent. Stir in the courgette slices and cook for a further 5 minutes, until the courgette is starting to soften but not colour. Add the peas and then pour in the stock. Bring to the boil, cover and simmer for 10 minutes until the courgette is tender. Turn off the heat, leave to cool then remove and discard the rosemary. Stir the mint and Greek yoghurt into the cooled soup then, using a hand-held blender or food processor, blend until completely smooth. Season to taste, then chill until ready to serve. Ladle into bowls and serve with Fudges Mature Cheddar & Black Pepper Flatbreads. To give the chilled soup a frothy finish, whizz with a hand blender just before serving. You could also add an ice cube or two to each bowlful. This soup is equally good served warm (but leave out the Greek yoghurt). Try a German white, with lively, honeyed grapefruit flavours, it’s just the wine to kick off a balmy summer evening in style. This recipe was first published in June 2006.